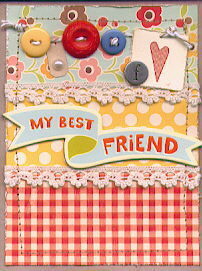 I created this card for the "It's All About Lace" challenge #12 at Crop Stop. Joan, I love this happy card! Great colors! Thanks for playing along on our CropStop Challenge Blog!! Great use of the lace theme, and the card just brightens everyone's day. Thank you for sharing this with us on the CropStop Challenge. lovely lace! Thanks for entering the CropStop Challenge! this is cute and adorable and happy and everything a card should be! Love this, Joan! The lace and buttons are so pretty!